The B-52H has a weapons payload of more than 70,000lb. The nuclear weapons capacity includes 12 ACMSs, 20 ALCMs and eight bombs. A B-52H based at RAF Fairford being loaded with AGM-86C CALCMs. A clip of eight ALCMs on the internal rotary launcher. In the cockpit, EVSs on the crew's consoles are used for low-level missions. B-52G carrying AGM-142 Raptor missiles. An AGM-86B cruise missile similar to those launched from B-52H bombers. The aerial refuelling operation usually takes place soon after take-off. The B-52H is the US Air Force’s long-range, large-payload multirole bomber and is known as the Stratofortress or the Buff (big ugly fat fellow). It is the USAF’s principal strategic nuclear and conventional weapons platform, and supports the US Navy in anti-surface and submarine warfare missions. 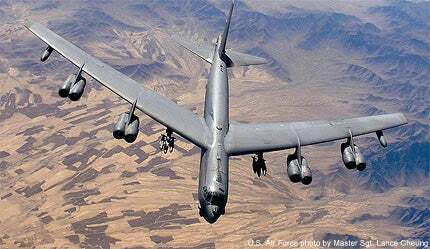 The B-52H is a very large aircraft, with a length of 159ft 4in (48.5m) and a take-off weight of 488,000lb (220,000kg). The all-metal skin bears a high proportion of the flight loading. When on the ground, the surface of the aircraft on the forward section of the fuselage has a wrinkled appearance. The skin expands and becomes smooth as the crew compartment is pressurised when the aircraft gains altitude. The B-52 celebrated its 50th anniversary (first flight April 1952) in April 2002 and is the longest serving combat aircraft in the world – a total of 744 were built. The B-52H entered service in 1961 and 104 were built. The last was delivered in October 1962. However, due to an extensive system and structural upgrades, its service life is expected to continue beyond the year 2030. The USAF retired 18 B-52H aircraft leaving 76 aircraft in service, stationed at Barksdale AFB, Louisiana and Minot AFB in North Dakota. The aircraft were retired at the rate of one every two weeks and are stored in a hangar at Tinker AFB in Oklahoma, in case they are required in future. The first aircraft was retired in July 2008. All B-52s were transferred from Air Combat Command (ACC) to the new Air Force Global Strike Command (AFGSC) in 2010. The US Air Force awarded a $750m, ten-year engineering sustainment programme (ESP) contract to Boeing in June 2009 to provide engineering and technical support services for the B-52H and its components, as well as support and test equipment, and system integration laboratory. A $22m contract was awarded to Boeing by US Air Force on 13 January 2010 under the ESP to provide engineering services to the B-52H. The US Air Force awarded a second $21.7m contract to Boeing in February 2011 under the ESP to continue supporting the B-52H Stratofortress bomber. In September 2009, the US Air Force awarded a $5.4m contract to Boeing to install an advanced satellite communication system on the B-52H. The installation of extremely high-frequency (EHF) system enables the aircraft to exchange data with ground station from ground, air and space platforms. Boeing was awarded a $70m contract by the Pentagon in August 2009 to upgrade the communications system of the B-52H bomber aircraft. Flight-testing of a B-52 using a blend of synthetic fuel and JP-8 began in September 2006, as part of a USAF process to develop more efficient fuel for its fleet, with less reliance on imported petrol. The B-52 was certificated for the synthetic fuel in August 2007. A project to expand the B-52’s mission to include a standoff jamming role, the B-52 SOJ, was cancelled in 2006. It involved fitting the aircraft with new large wingtip pods, weighing up to 2,260kg, which would carry a suite of powerful jamming systems. 16 SOJ systems were required. However, in October 2007, Boeing announced that it was teaming with Northrop Grumman to develop a new electronic attack capability for the B-52, the B-52H core component jammer (CCJ) programme. Boeing was awarded a USAF contract in June 2008 to develop the technologies required for the CCJ programme. In April 2005, the USAF awarded Boeing a contract for the system design and development (SDD) of the B-52 combat network communications technology (CONECT) programme, which gives the aircraft network-centric operations (NCO) capability. CONECT includes new computer architecture and colour displays, Link 17 tactical datalink and an advanced wideband terminal, which allows the dynamic retasking of missions and weapons during flight and provide increased situational awareness. The SDD phase was completed in early 2009. In August 2009, Boeing delivered the B-52H upgraded with CONECT to the US Air Force with the first flight test carried out on 25 January 2010 at Edwards Air Force Base. In December 2011, Boeing announced that all flight testings required for the B-52 CONECT programme to attain low rate initial production (LRIP) clearance from the US Air Force were carried out at Edwards Air Force Base, California. Milestone C authorisation for the LRIP is scheduled for 2012. The B-52H, with a weapons payload of more than 70,000lb, is capable of carrying the most diverse range of weapons of any combat aircraft. The nuclear weapons capacity includes 12 AGM-129 advanced cruise missiles (ACMS), 20 AGM-86A air-launched cruise missiles (ALCM) and eight bombs. The conventional weapons payload is eight AGM-84 Harpoon missiles, four AGM-142 Raptor missiles, 51 500lb bombs, 30 1,000lb bombs, 20 AGM-86C conventional air-launched cruise missiles (CALCM), 12 joint stand-off weapons (JSOW), 12 joint direct-attack munitions (JDAM) and 16 wind-corrected munitions dispenser (WCMD). WCMD was first deployed by the B-52 in 2002 in Afghanistan. JSOW entered service in 2003 and was deployed during Operation Iraqi Freedom. The B-52 was the first aircraft to be equipped with the joint air-to-surface standoff missile (JASSM), which was cleared for operational use in October 2003. In June 2006, Boeing was awarded a contract for the B-52 smart weapons integration next-generation (SWING), to support integration of future weapon systems such as JASSM extended-range, small diameter bomb and boost phase interceptor, until 2020. In October 2006, Boeing announced that the B-52 can carry 32 small diameter bombs (SDB) on the common strategic rotary launcher in the bomb bay. During Operation Iraqi Freedom in April 2003, a B-52 was fitted with the Northrop Grumman Litening II laser targeting pod, which was used to strike targets in Northern Iraq. In 2007, the USAF began fitting Litening to the B-52 fleet. The B-52 is fitted with the Lockheed Martin Sniper ATP advanced targeting pod. By December 2009, the Sniper demonstrated its capability to operate on B-52H aircraft. In October 2010, Lockheed Martin-built JASSM successfully accomplished Lot 7 Reliability Assessment Programme flight tests at White Sands Missile Range, NM, by using B-52 and F-16 aircraft against a wide range of targets in various operational scenarios. Boeing was awarded a eight-year, $11.9bn contract by the US Air Force in September 2010 to overhaul B-52H weapons systems. The B-52H can also deliver 51 500lb, 30 1,000lb and 20 2,000lb navy mines. The B-52H is equipped with a wide range of electronic warfare equipment. The ITT AN/ALQ-172(V)2 electronic countermeasures system features multi-band threat recognition and multiple threat jamming. The AN/ALR-20A radar warning system detects and prioritises multiple threats. The Northrop Grumman (Litton) AN/ALR-46 digital warning receiver detects radar emissions in the 2GHz to 18GHz band, and can simultaneously identify up to 16 radar signals. Northrop Grumman’s AN/ALQ-155 jammer power management system gives 360° coverage in D,E,F,G, and H radar bands. It is also equipped with Motorola AN/ALQ-122 multiple false target generator, AN/ALT-32 noise jammer and Northrop Grumman AN/ALQ-153 tail warning set, which is a pulse Doppler threat warner. 12 AN/ALE-20 infrared flare dispensers and eight launchers for the AN/ALE-24 chaff dispenser are fitted. The US Air Force awarded a firm-fixed-price contract worth $45m to Radant Technologies in October 2011 to supersede the radomes of its B-52 Stratofortress bombers as part of the Radome Replacement Programme (RRP) undertaken by the Defense Logistics Agency (DLA). The programme will be carried out for the next seven years. Under the nose section are the steerable chin turrets for the AN/ASQ-151 electro-optical viewing system (EVS), which consists of the Raytheon AN/AAQ-6 forward-looking infrared (FLIR) in the starboard turret and Northrop Grumman AN/AVQ-22 low-light-level television camera (LLTV) in the port turret. The images from the EVS are displayed on monochrome screens on the flight deck and on the lower deck. The AN/ASQ-176 offensive avionics system (OAS) includes a Northrop Grumman strategic radar, Honeywell radar altimeter, Smiths attitude heading and reference system, Tercom terrain comparison, Teledyne Ryan Doppler navigation radar, Honeywell AN/ASN-131 inertial navigation system, and IBM / Raytheon AN/ASQ-38 bombing and navigation system. In January 2000, Boeing received a $108m contract from the US Air Force to upgrade the OAS. The B-52 avionics midlife improvement (AMI) programme replaces the INS with the SNU-84 INS and provide open architecture avionics computers with faster processors, and with a new data transfer system. Flight testing of the AMI began in December 2002 and more than 20 AMI kits have been delivered to the USAF for installation by field teams. The B-52H has eight Pratt & Whitney TF33-P-3 turbofan engines, each providing more than 17,000lb of thrust. The aircraft has ten internal plus two external fuel tanks with a capacity of over 181,000l, which give an unrefuelled range of more than 8,600 miles. The operational range with one air refuelling is 7,500nm. There has been increasing support for an upgrade programme to re-engine the B-52H. Boeing has received a contract to study the options which include proposals for either four or eight new engines. New turbofan engines increase the unrefuelled range and provide the aircraft with the capability to strike a target located anywhere on earth from a CONUS (continental US) base with a single refuelling. The aircraft can climb at the rate of 31.85m/s. The maximum speed is 1,000km/h. The range and service ceiling of the B-52H are 15,937km and 15,151m respectively. The aircraft can fly to a maximum height of 15,240m. It weighs around 83,250kg and the maximum take-off weight is 220,000kg.